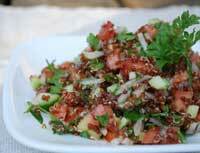 Usually, tabouli salad is made with bulgur. Using quinoa instead of bulgur makes it even healthier, alkalizing and gluten-free. Is tabouli salad good for you? This is one of the frequently asked questions. Of course it is good for you! Is tabouli salad healthy? Of course it is! Whole grains and massive amounts of parlsey make tablouli salad a very healthy meal. It lowers blood cholesterol, helps you burn fat, protects your brain from early aging, protects your body from cancer and heart disease. The list goes doesn't stop here, but I hope this is enough to motivate you to use a quinoa tabouli salad recipe immediately! 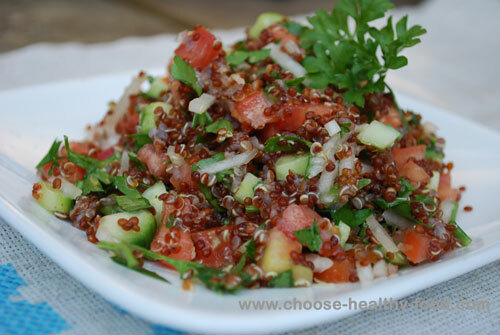 When you make quinoa tabouli salad (using quinoa instead of bulgur), the benefits just get better, because quinoa is one of the top super foods. Just make sure that you do not add massive amounts of oil ( even olive oil) to the tabouli salad. You need some oil because Vitamin A in parsley is oil-soluble, which means it gets absorbed only when accompanied by oil. Too much oil hardens arteries, makes you gain weight and starts inflammation in the body, so make sure you add just enough for the salad to taste good and get parsley digested. Enjoy! Rinse quinoa, and steam it with water on the sausepan until cooked for 25-30 minutes. Alternatively, rinse quinoa and soak it in the water overnight, cook on medium for 10-15 minutes. Transfer quinoa into the bowl; cool it and add lemon juice, salt and olive oil. Add chopped onion, garlic and parsley, mix well. Add tomatoes and cucumbers. Toss.